A contact form appears below if you'd like to email us at bulk-essiac-tea.com. We always respond within 24 hours. Order essiac herbs at the cost of less than $1 per day. If you prefer to place a phone order, or would like to speak with someone over the phone, you may call our Toll-Free number: 1-866-ESSIAC1 (377-4221). An alternate number is 1-978-504-9517. We also accept mail orders. Pricing is explained on the order form. Please print the essiac tea order form (Click on the link "essiac tea order form" and wait for the page to load. Once it's loaded, Right-click on the link "bulk-essiac-tea-order-form," and click "Save Link As" or "Save Target As" which will save the document to your computer). If you cannot print the order form, contact us using the contact form below, and we will provide you with a price quote for your check or money order, and the address to send your payment. 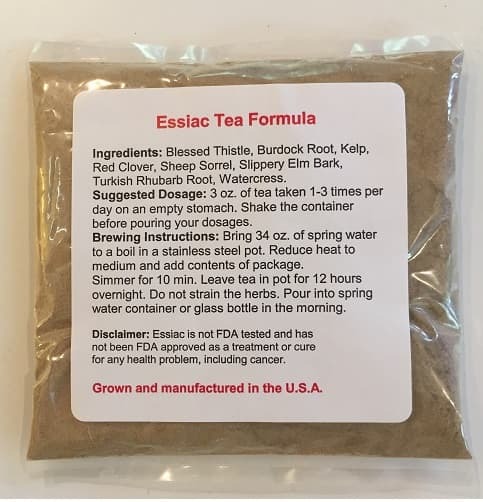 All of the questions regarding essiac tea that we receive on a regular basis have already been answered for your convenience at our essiac tea frequently asked questions page. Check that page to get an instant answer to your question! Scroll down below the contact form to see our Mailing Address. Please do not send us returns without approving them first. Click here to read about how returns work. You may also reach out to us on our Facebook Page. You can also connect on our Twitter Page. Go here for our Instagram. We are committed to supplying you with the best quality essiac tea for the lowest possible price." Click here to contact us, or call Toll-Free: 1-866-ESSIAC1 (377-4221). Copyright 2017 by Gina Paulhus. All rights reserved.